stampwithamber - Amber Meulenbelt, independant Stampin' Up! demonstrator: Paper Pumpkin Promotion! You've heard me talk a bit about Paper Pumpkin since its inception in March, but there hasn't been a promotional offer until now! 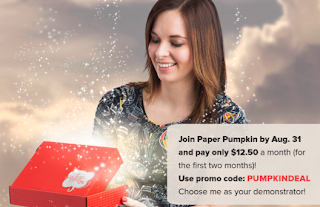 From now through August 31, 2013, new Paper Pumpkin subscribers can use the promo code PUMPKINDEAL to join Paper Pumpkin for only $12.50 a month for the first two months! You'll enjoy great savings for the first two months. Then, after you've received two months' worth of Paper Pumpkin kits, the price for future kits will go back to the regular price: $24.95. If you sign up before August 10th, you will receive the Welcome Kit in August and the regular 'surprise' kit in September, and if you sign up after August 10th, you'll get your Welcome Kit in September and the October kit will be your second kit. Please note that this offer is only for new customers - if you cancel your existing membership and re-sign up with the promo code, the system will recognize you and reinstate your former membership. You certainly may sign up with a new email address (if you're trying to fool the system), but be warned that you will receive the same Welcome Kit you got when you signed up the first time!